A friend of mine who's just as avid a leisure artist and art supply collector told me about the Zebra G Comics Nib. I tried dip pens repeatedly in the past, frustrated by how hard they were to clean, how often they needed to be dipped and the irregularity of the line. From crowquill ones to those varied nibs you can get in sets at hobby shops, they enchanted me and frustrated me constantly. Yet I knew professional illustrators and comics artists use them often, for when you want a more expressive line than a technical pen. On her advice, I went to JetPen, Inc. and ordered a pack of 10 Zebra G comic pen nibs, a bottle of the Kuretake Manga Black Ink and a wooden Tachikawa Comic Pen Holder. Since JetPen does free shipping with a $25 order, I chose the fancier wooden holder that comes with a pen cap to protect the nib if you leave it sitting around in a pencil cup -- the extra 60 cents pushed my order just over $25 and saved me the cost of shipping. The link goes directly to this product. They shipped fast. I liked the sketches my friend did and while I usually use fountain pens when I want a flexible, expressive tip -- or brush tip pens like the Pigma Micron brush tip -- there's a place in my lineup for a narrow yet expressive line that responds to pressure. The package arrived fast, just as it had for my friend, by Priority Mail. I opened it up and found out these Japanese products don't label bilingual. Everything's labeled in Japanese. 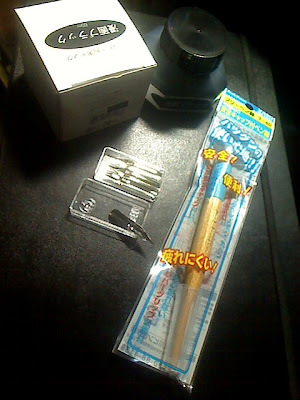 The instructions for putting the pen nib into the holder were easy to understand even with Japanese captions though, so I had no trouble assembling my pen. The nibs were safely packed in a strong, clear little plastic nibs box. This is a good thing. I've bought other nibs that came loose in a glassine envelope or just a paper envelope, where I couldn't tell what they were and they scattered out into the bottom of my sketching supplies box. I won't have trouble finding or recognizing my Zebra G nibs in that box or lose them under my stash of kneaded erasers. The bottle of ink was a pleasant surprise. I showed the box it came in and set the bottle next to it. Whoever designed this novel has cats or small children. It's short, squat, plastic and will not tip over if your sleeve bumps it. That's a nice safe bottle for ink to sit out on your desk or table. The mouth is pleasantly wide too, making it easy to aim when you're looking more at your drawing than at where you're dipping the pen. Kuretake Manga Black Ink is heavier than normal India ink, waterproof when dry and cleans off the nib after use with Sansodor odorless mineral spirits -- that's what I washed the nib with when water just didn't remove the dried ink. My friend has tried other inks with this nib and the Kuretake ink sticks better in it, allowing a longer flow before you need to dip again. However, you could use any bottled ink with this pen just like any other dip pen. Winsor & Newton's pretty colored Drawing Inks, acrylic drawing inks, Bombay India Inks all worked well with it when she tested hers. My friend was right about not needing to dip often. In the drawing below, I penciled in my cat sketch and then decided to caption it writing directly with the pen. It works in both or any direction, unlike most dip pens, though the line is stronger when pulled down vertically than when swished to the side to cross a T. It responds well to pressure and the line is very expressive, but fine enough for writing or drawing detailed ink sketches. The first dip, in which I touched the bottom of the ink bottle with the point of the nib, lasted until I reached the end of the word "Kuretake" on that caption. That's amazing. I've done other dip pens and I'd have dipped about once or twice a line on that caption in order to write that much. She was definitely right about that. It flowed smoothly from the start, another good point. Its real value doesn't show in lettering as much as the sketch -- the expressive lines really brought my cat's fur texture to life and made it very easy to shade in his dark ears, tail and visible foot. I found the feel of the pen left me working a little looser than usual, just as brush pens do. If you like dip pens, enjoy doing pen and ink artwork and want something you can use with all those fancy bottled colored and iridescent and interesting inks available, the Zebra G Comics Nib is a good choice. I have seen many illustrations with this type of line used and it does give a certain flair to the art. You won't pry me away from my beloved Pigma Micron pens for their convenience... but when I set up in the studio and want this look, these nibs are a great way to get it. One last tip. You may wonder why you'd want a dip pen in the first place. Colored inks are the answer -- you can change colors in a moment, wiping the nib with a clean relatively lint-free cloth, then dip another color. I realized the morning after this that I've got an incredible resource now for using Inktense as liquid ink. Just set out a porcelain palette, shave the points of different colors into different palette cups and add a drop or two of water to make liquid ink. The range of colors is 72 -- much wider than the 16 colors of Winsor & Newton drawing inks or quite a few other good colored inks. Colored ink lines in a pen and wash painting don't dissolve when you add watercolor washes over them, but they can become very subtle if you're using colors other than black. Inktense has Payne's Grey, which is very useful, a wide variety of browns, blues, everything really. So the next time you want to try that colored ink and wash painting technique, think about using a dip pen like the Zebra G Comics Nib. nice review, Robert.....I'm just about out of waterproof black. Think I'll give this a try. Very good review. Good timing too, I've worn out my old nib and need to buy more. I'm going to give the Zebra G a shot! Hi~ I was wondering if you'd ever tried using alcohol-based markers over the Kuretake Manga Black Ink? I'm looking for a dip ink that is both waterproof and alcohol proof. I know it says it is, but I don't have the money to buy it and test it to find out that it actually isn't. American products don't 'label bilingual' either, you entitled whiner. Sakura Pigma Microns Colors and Giveaway Winner!